‘Limited Edition’ publishing in a digital age. 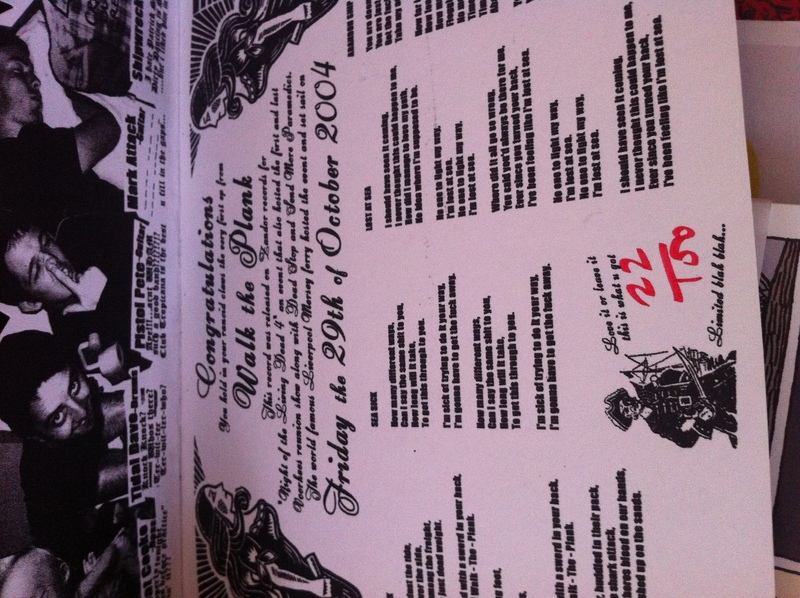 Walk The Plank 7" first press, "limited blah blah"
Today is Record Store Day 2012. A day designed to “celebrate the art of music” by encouraging people to visit, engage with, and purchase physical products from physical record shops. It’s a noble aim, to support something that has brought a lot of light to people’s lives — the people at Probe Records in Liverpool, Piccadilly Records in Manchester have been particularly helpful in nudging me down avenues that the racks of HMV, Virgin MegaStore or the algorithms of Amazon’s recommendation engines never could. The first thing that is particularly interesting about RSD is that it mimics the music industry’s recent shift from sales to events. Touring acts are now the primary focus for income from the major labels, and RSD is an event to encourage merchandise sales. There are plenty of in-store performances in record shops to entice the curious. Although, if you’re a regular at Rough Trade East in London, you might be put-off by today’s special performance: Keane. The second thing that is interesting is the means in which RSD offers added value: limited edition records. Small number pressings of seven/twelve inches by bands such as Arctic Monkeys, The Hives, Talibam!, Belle & Sebastian and, er, Abba. What these two things are doing is drawing a massive line in the sand, demonstrating what record stores can do that the online merchants of Amazon, eBay, Discogs etc can’t do: physicality and ‘value’. The online value is usually down to price; offline value is about being able to be part of something, hold something beautiful, and — crucially — be one of the few people to have that experience or product. As Andy Votel notes, “tangible & sociable (not invisible)“. The internet does scale well, the ‘real’ world does intimacy well. The question is: can the web successfully do limited edition publishing, with intimate value? It is dangerous to mimic the models of one form in another, and I don’t want to see a replica, but the frictionlessness of online is perverting the value in supply and demand. If everything is always available, can it have value? It’s a question I’ve looked at briefly in some work. MemCode — a small publishing project — follows an issue model of publishing, looking at quarterly editions of memories and form experiments (issue 2, blue). An initial idea was to have a payment system, for intangible moments/memories, with a built in half-life of the link. That’s a form of the solution, but it doesn’t enable a person to retain the ‘product’ permanently, and leaving a trail of dead links across the web is littering. Another form of this is a project I have worked on with Philter Phactory’s Weavrs MMM — a storytelling platform for bots, where a majority of the narrative is hard-written and a percentage is generated based on searches and API calls. It’s a version of ltd edt as each version is likely very different, but it’s not quite the same. The first thousand to click on it will experience NO paywall. I think everyone who clicks on it after that dies, sadly. But! Still! I think this is the start of something along the lines of what I describe above. The offering is the value of not having to pay, but also the satisfaction of being one of the people who got it when it was available. A limited edition offering, a ‘first pressing’. I downloaded the iPhone app Weddar yesterday. It’s a cute application that seeks to crowdsource the weather in the area that you’re in. It’s not about meteorological fact (22°C, 6mph Westerly wind, 78% humidity etc), but about how the weather is perceived. Weddar: how does it feel? I’m struck by the simplicity of its question, and the basic idea behind it: reporting on how it ‘feels’ is quietly brilliant. How does it feel?